It might just be a quirk of vocabulary, but I like feeling as though our house has a garden rather than a yard. Gardens are visually interesting and beautiful year-round, or at least that’s my dream. I like the design element of planning out plants, borders and pathways (I’d quite like to be a landscape architect in one of my many unlived parallel lives) and it’s rewarding when you see all your hard work begin to pull together. This bluestone-coloured paver edging isn’t as vibrant as the plants, but it adds so much to the overall design. OH! HELLO! It’s me, Ghost Steph. I’m here, just been busy over the last couple months. I didn’t intend to take a hiatus, it just… happened, and I feel terrible about it. Here, let me show you the full process of edging our garden beds, plus a few pretty photos of plants and grass. We started this in March, but to be fair, most of the time passed was spent waiting for grass to grow. Gardens, I swear. November 2013 – August 2015. 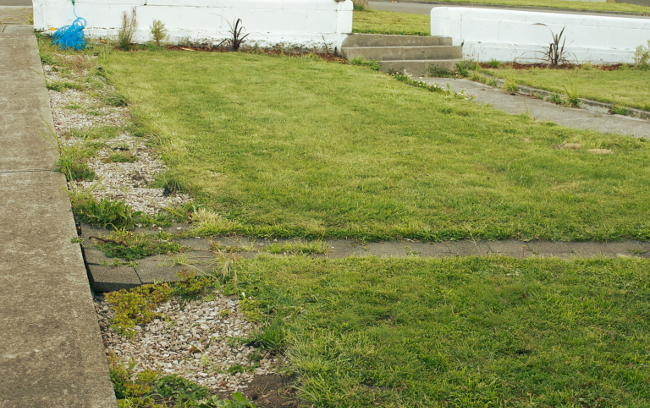 I was set on laying some garden edging around our beds out front; it’d cleanly define the beds/lawn and bring a bit of polish to the whole area. Stone edging (limestone, bluestone, sandstone etc) would last forever, but I wanted something less chunky, more streamlined. Hot rolled steel looks super flash and modern, but getting custom lengths done in a decent quality steel would get spendy, plus we wanted a ‘mowing strip’ for the lawnmower wheels to run alongside the edges so we wouldn’t have to clean them up with a weed whacker every week. 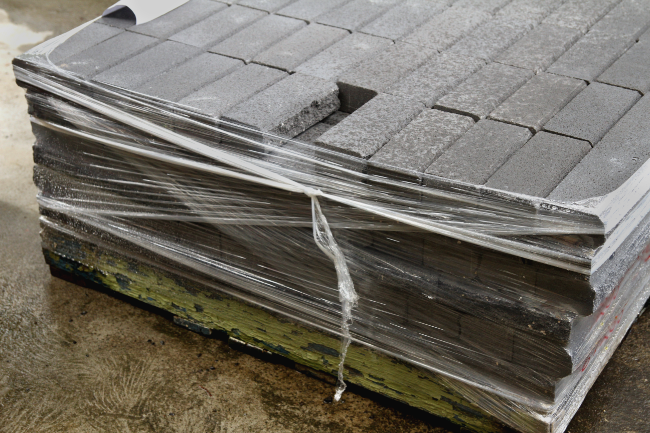 In the end, we got a pallet of Edgestone pavers from Island Block & Paving. I liked the thinner size, beveled profile and dark-grey ‘bluestone’ colour, and the brick should last ages. It took a few afternoons to lay pavers around the perimeter. (As a preliminary step, I sprayed the grass in front of the beds with non-residual herbicide, just to kill off some of the runners.) We dug long, shallow trenches with a mattock, and then set up a bricklaying line with neon twine to ensure the bricks would be aligned properly. With the trenches cleared out and ready, Jamie mixed batches of concrete using bulk aggregate, bags of cement and a janky old wheelbarrow, since we didn’t want to ruin our good one. Others can explain how to mix concrete better than I can; “not too firm, not too soupy” is the best I can do. Bulk aggregate + cement is also FAR more cost-effective than premixed bags, in case you were wondering. With the concrete mixed, we spread it out into the trenches, 1-2m at a time. I used a bricklaying float to flatten the concrete and bring a thin layer of water to the surface, which bonds the concrete to the brick. On a dry summery day, it helps to dampen the trench before laying concrete; this prevents the soil from immediately sucking all the water out of the concrete. We laid some bricks, tamped them in place with a rubber mallet, mixed more concrete, laid some more bricks, dug some more trenches. Repeat, repeat, repeat. Island Block has a nice, short video showing how it’s done. That guy must have been gentle with the claw hammer, though–we found these bricks to be more fragile than your standard bricks. Jamie also had success using a small angle grinder to cut bricks down to size for the end gaps. Finally, we had edging… and great gaps around either edge that needed to be filled in. We picked up a small load of fresh loam to backfill the gaps, plus some grass seed/fertiliser mix to spread throughout. Things were looking really great around this point, to be sure. One final step: brushing paver sand into the gaps. Paver sand has a small amount of bonding agents added, so it’ll stay more secure than regular sand. It only comes in sand-colour, though, so I added a few spoonfuls of black cement-colouring pigment until it looked like a similar shade of grey. Which brings us to this week. It’s starting to look like a real yard! Shush, don’t mention the house itself. The plants themselves aren’t looking too bad, either. From nearest to furthest, you’re looking at a ‘Fireworks’ grevillea, dwarf woolly-bush, purple flax and ‘Limelight’ acacias, another grevillea hiding behind the flax, and my winter-bronzed Aulax cancellata. That one wasn’t thrilled about me digging around its roots, but I’m hoping its size and extra TLC will ensure it pulls through. Just like last year, winter is a great time for grevilleas. Go grevillea go! My mini kangaroo paws along the driveway are still blooming their heads off, too. I keep meaning to cut them down to the ground for next year’s growth, but how could I possibly chop off all that red and pink? Eventually, we’ll install another bed in front of the house, plus some mixed gravel/paver paths. (See that mess of bricks in the pathway entrance, two photos above? Yeah.) We’ve made good progress so far, it’s time to do more. Once again: I’m sorry about the blog hiatus. July/August have been flat-chat for the two of us, and the winter weather is hampering our progress and frankly, our motivation. I’ve also been working through some mental health stuff, which doesn’t help matters, but I’m feeling pretty all right going forward. There’s so much to share: study updates, herb garden planning, weird tip shop treasures, travel reports, and — the big one — exterior painting! What have you been up to? Nice to have you back and teaching me about gardening again. (Just looked up arborvitae and I’m with you on their disappearance!) Your ‘before and after’s are very impressive and I love your little kangaroo paws. Sorry to hear you haven’t been in top form, but I reckon getting your hands dirty (dirt, paint, etc) has to be good for that. Hi again! It’s good to hear from you. 🙂 If nothing else I can warn people to learn from all my gardening mistakes, haha. Have you been considering any kangaroo paws for your new home? There’s so many colours available! Nice to see you back Steph, I thought maybe my notifications had gotten mixed up. 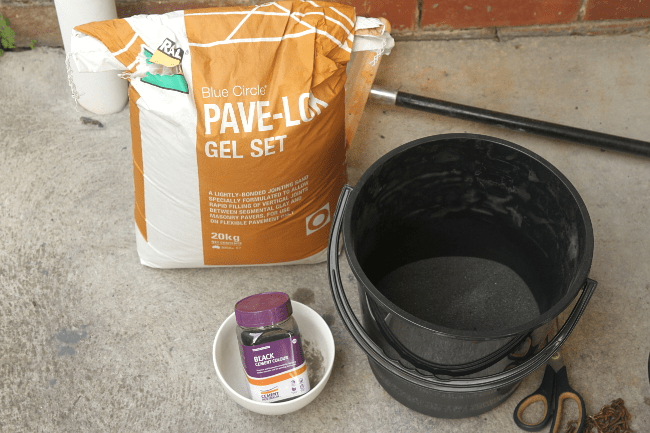 Interesting post about doing the brick edging, timely as I will probably be building my own brick fence in a couple of months. It’s so nice to see the fruits of your labour. The kangaroo paws are beautiful. Instead of thinking of it as pruning them back, you could use the opportunity to get some cut flowers into your home. The kangaroo paws are stellar! I planted two of them this summer and they promptly died. I don’t usually kill plants like that and I feel I am just not used to this California soil after two years. I do like the edging that you did, nice job! Thanks Vanessa! I’m sorry to hear your kangaroo paws didn’t pull through. 🙁 I had to mix gypsum into our heavy soil to make the kangaroo paws and mini-banksias happy, and I found they actually like having summer water despite their reputation for being drought-tolerant. I’m not convinced mine will be long-lived, the mini versions are less hardy than full-size versions. Good luck with everything else in your CA garden!